The fall weather is not cooperating here in Missouri but I'm doing all the fall things any way. Jeans and boots? Yes. Pumpkin everything? Yes. Soups and stews? Yes. Even if it is 90 degrees out, I'm not giving in! 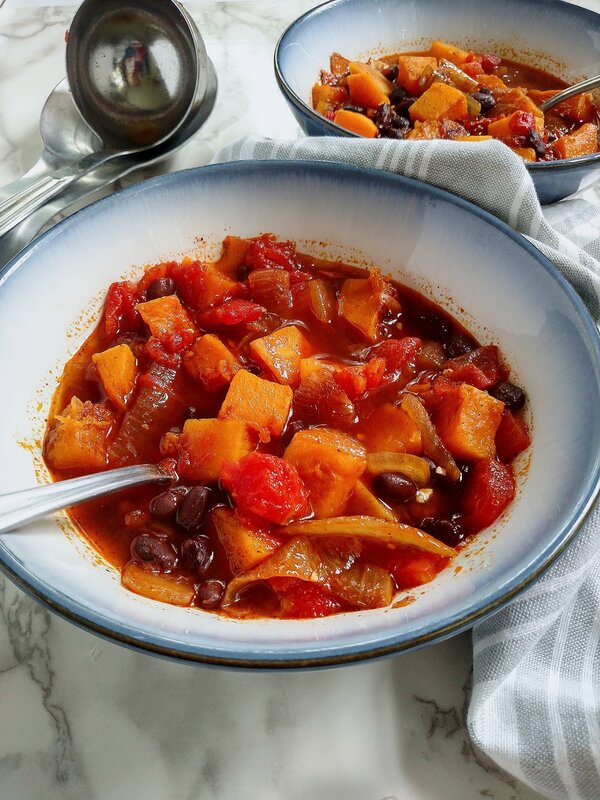 This recipe has fall written all over it and is one of my favorite ways to eat butternut squash. Butternut squash is slightly sweet and similar in taste to pumpkin. It is a great source of Vitamin A, Vitamin C, and fiber. Don't be intimidated by it's tough exterior! It is easy to peel and cut up with a sharp knife and veggie peeler. Check out the The Kitchn's tutorial for more on how to peel and cut up a butternut squash into cubes, as this recipe calls for. This recipe is from a plant based cookbook called Vegan Planet. While I don't believe in diets, I do have a heart for veganism as it was what initially got me interested in nutrition at the age of 13, when I decided to follow a vegan diet out of compassion for animals. My parents were concerned that it was not a healthy diet for a growing teen, so I spent a lot of time researching nutrition to help build my case to them that it could be. I stayed vegan for nearly 7 years before I was not able to follow it in a healthy way, found it too restrictive, and honestly missed cheese wayyyyy too much. 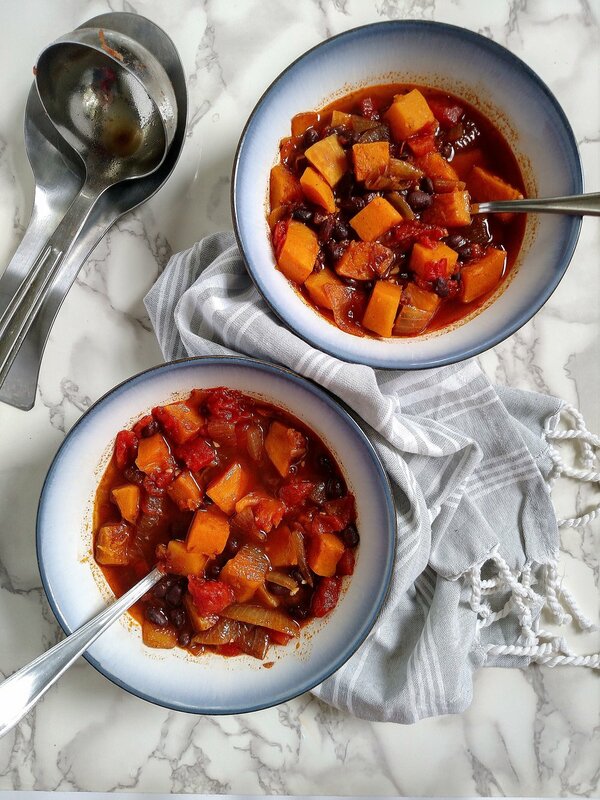 This soup is so filling and hearty, with plenty of protein from the black beans. Keep in mind that when you make this, it will make a lot! It is great as leftovers! It does freeze well and leftovers will keep in the fridge for up to a week. What is your favorite fall recipe? Share below! In a large stock pot or sauce pan, heat olive oil over medium high heat. Add onions, garlic, and jalapeno and cook for about 5 minutes until onions are softened. Add remaining ingredients, except for the black beans, and stir until well combined. Cover pot with lid and cook over medium high heat for 30 minutes, stirring on occasion, until squash is tender. Stir in the black beans and leave uncovered, cooking for an additional 15 minutes. Serve immediately. Recipe adapted from Vegan Planet cookbook.